Lucky are newspaper readers in Southern California. 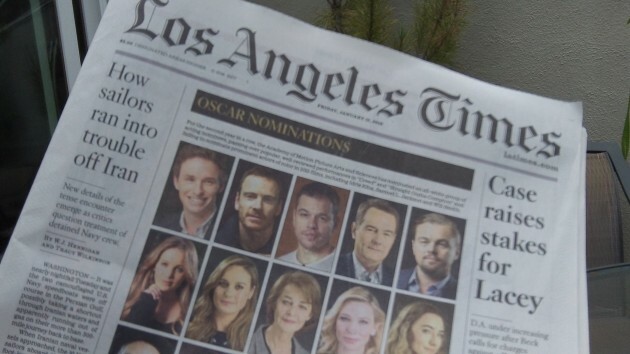 They have easy access to the Los Angeles Times, a paper that rewards those who subscribe or — as I did Friday — go across the street to the 7-Eleven and buy a weekday copy for two bucks (plus 16 cents tax). The Times isn’t what it used to be a generation ago. But for someone who wants more than online headlines and quick summaries of the daily crap that goes on around he word, it’s till a worthwhile investment of money and time. For one thing, the Times still has a network of staff members or special correspondents reporting from around the country and the world. If it uses any of the homogenized wire service copy that fills what’s left of most smaller papers, I didn’t find any when I went through Friday’s paper. Instead, I appreciated a long story by staff writer Cindy Carcamo, reporting from the hamlet of Dillon, Montana. There, among the regulars at a diner named Los Koritas, she found a good angle on the topic of illegal immigration. You read a story like that and think, hey, maybe there are sane people left in this country after all. At least in Montana. With time on my hands, I drifted to the opinion pages. Besides three editorials and 11 intelligent letters on topics from a police shooting to the Powerball lottery, they gave me a strong local cartoon on a national topic and three columns. The editorials put me in mind of Professor Foley, a Times editorial staffer who moonlighted at the local college, trying to teach me and a handful of other aspiring journalists how to write editorials half a century ago. Of the three columns, one was written by Mark Williams, an Oregon Health Science executive who recalled the time when, as a U of O law student years ago, he “occupied” the Malheur National Wildlife Refuge as a hitchhiking tourist. To get out of the weather he spent the night in the refuge’s bird museum, which was unlocked, and in the morning he left.